The solar panels atop the Madison Public Library can be seen lower right in this January 2015 image. Madison’s City Council adopted an ambitious energy plan at its meeting on Tuesday June 7, with only one no vote from the 20-member council. The plan commits the city to reduce its carbon emissions by 80 percent by 2050, reduce overall energy consumption by half by 2030, and get a quarter of its electricity, heating and transportation energy from clean sources by 2025. Mitch Brey, campaign organizer of the group RePower Madison, described the plan as an important step in creating clean energy policies and programs in the city. He noted that some aspects of the plan are already enshrined in city or state policy, but the new plan calls for new resources or action to help fulfill those goals. Along with the aforementioned targets, the plan calls for establishing a city-wide Property Assessed Clean Energy (PACE) program, making it easier for property owners to finance energy improvements; developing an inventory of all the city-owned property suitable for rooftop solar; and ensuring implementation of a benchmarking resolution passed last year, which would document buildings’ current energy consumption to chart future improvements. It also calls for convening a working group to review the city’s existing climate change plan, creating permanent staff positions focused on energy issues; and supporting regional clean energy and carbon reduction efforts including with local colleges and universities and the sewer agency. He pointed to the inventory of buildings ripe for solar development as an example of how the real test will come when the city acts on the information it has gathered. “That’s great, something the city should do, and once they have that list the next step would obviously be to install solar in those areas,” he said. 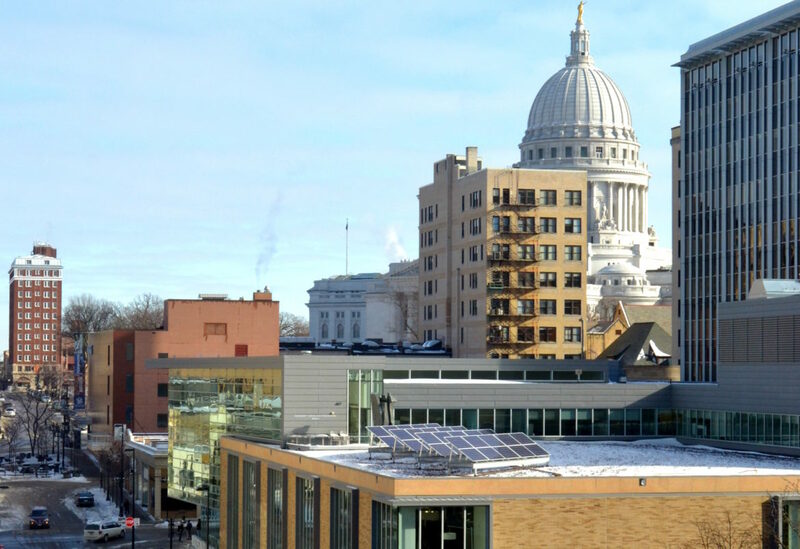 Madison is widely known for its culture of sustainability and environmentalism, a culture largely reflected by elected officials and civic leaders including through the existence of the Sustainable Madison Committee. But the local utility, Madison Gas & Electric (MGE), has drawn criticism from clean energy advocates in recent years for policies seen as hostile to distributed solar, including significant increases in fixed charges the customer pays regardless of how much energy they use. The utility promised not to increase fixed rates this year, after outcry about the previous increases. Brey said that they’d like the utility to reduce the current fixed rates, which are among the highest in the state. MGE has announced its commitment to clean energy including its own stakeholder and community engagement process, though Brey and others worry that the utility will not carry out the full process outlined in the plan. Brey hopes the city plan will help sustain or bolster MGE’s community engagement process. The plan suggests specific collaborative action between the city and MGE which could include promoting electric vehicles, developing a utility-scale solar farm, upgrading the grid including investments in smart meters and smart inverters for solar panels, and developing rate designs that encourage using energy at low-cost times. Sustainable Madison Committee member Rajan Shukla described the plan to the Capital Times as symbolic of larger struggles for a clean and just environment, likening it to the fight for clean water in India, where his family is from.